Corrosion removed from the base of a Saturn V engine thrust chamber recovered by Amazon CEO Jeff Bezos has exposed the serial number "Unit No 2044" stamped into the part's surface. 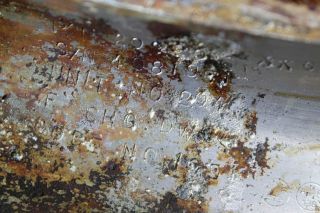 The marking positively identifies the F-1 part as having launched on Apollo 11. SpaceWorks technician Jerrad Alexander uses a brush to clean an F-1 engine thrust chamber at the Kansas Cosmosphere. Seen in the background, the mist from one of the sprays treating the artifacts with freshwater to remove ocean debris.